Products FDC x2 The same cover but once with Amiel machine stamps and another one with SMD machine stamps. 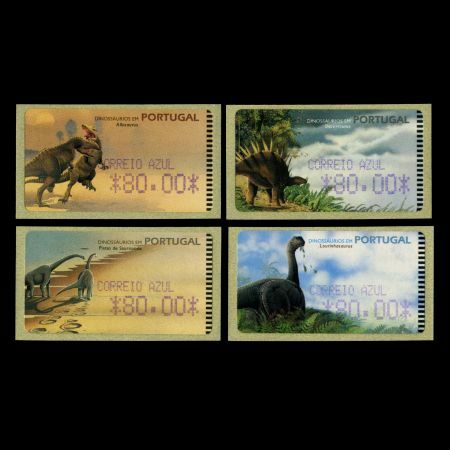 In November 1999 Post Authority of Portugal introduce new set of machine (ATM) stamps with title "Dinosaurs of Portugal" (Dinossurios em Portugal). 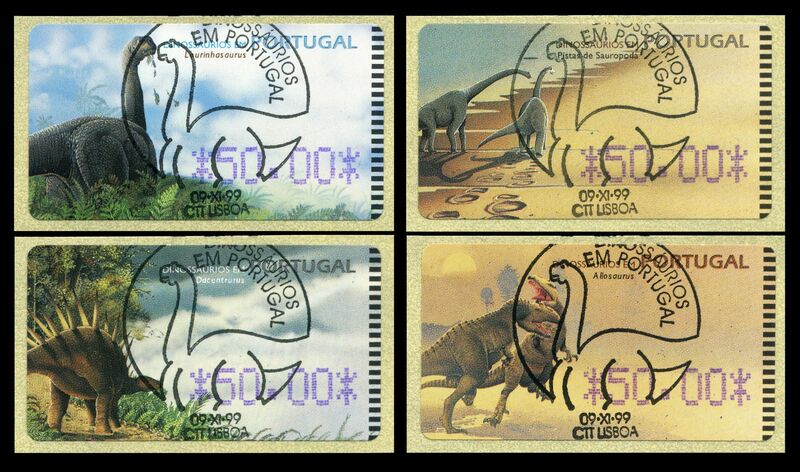 Four different stamp-template depicted some dinosaurs and some of their footprints. 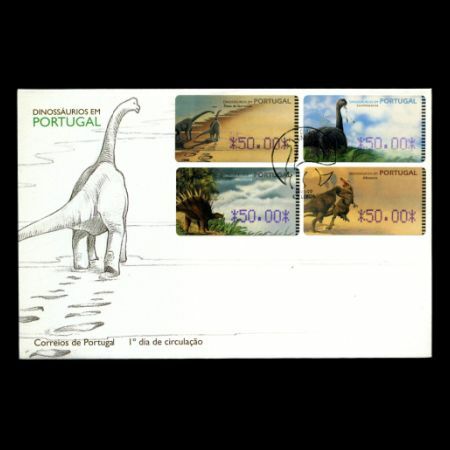 Fossilized remains of all dinosaurs depicted on the stamps as well as their footprints are found in Portugal. This issue was design by Jos Projecto and Mariana Santos . 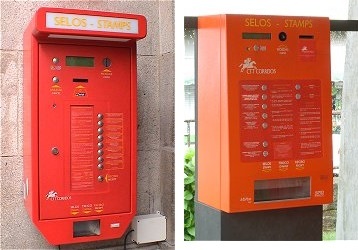 The ATM's were printed by the Ovelar spanish firm that is known to print the first Epelsa ATM's for Spain . 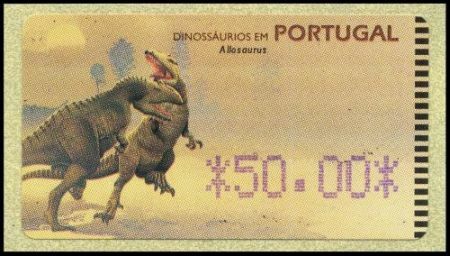 These dinosaur ATM stamps issued with 7 predefined values from PTE (Portuguese Escudo) 5o to PTE 350, see a table below for more details. Like in the other ATM issues it was possible to obtain some errors and varieties like double printings , missing numbers , and many others . Note: Escudo 85 stamps was available at ATM machines, but not sold at philatelic desks of Portuguese Post, therefore its more difficult to find. 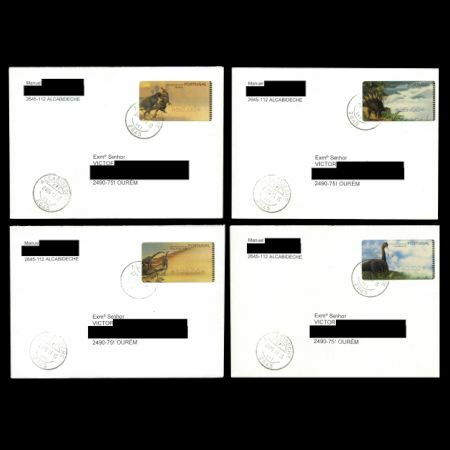 Here are some examples of ATM and SMD stamps. Stamps issued by Amiel machine made bold and large text. Stamps are issued by SMD machine had smaller and thin text on it. 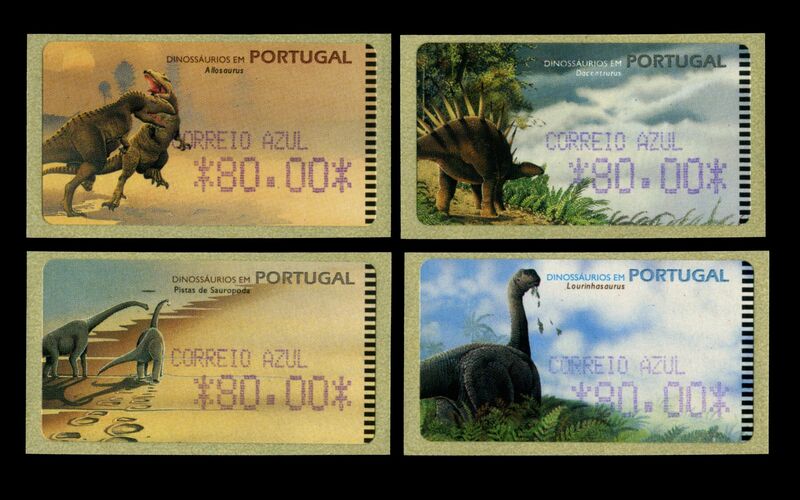 These dinosaur ATM stamps were on sale less than half an year, till 22.03.2000. 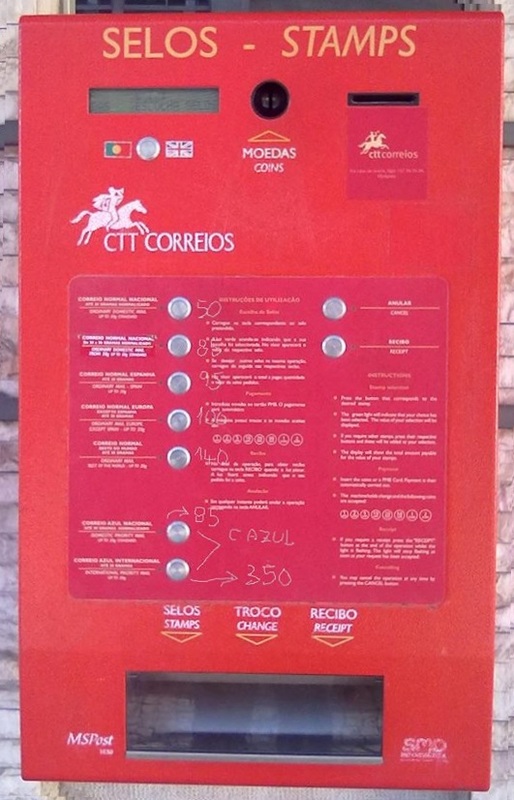 Since 21.02.2000 ATM machines print out stamps with values at both currencies: Escudos and Euro and later on between January and March of 2002 in Euro currency only. 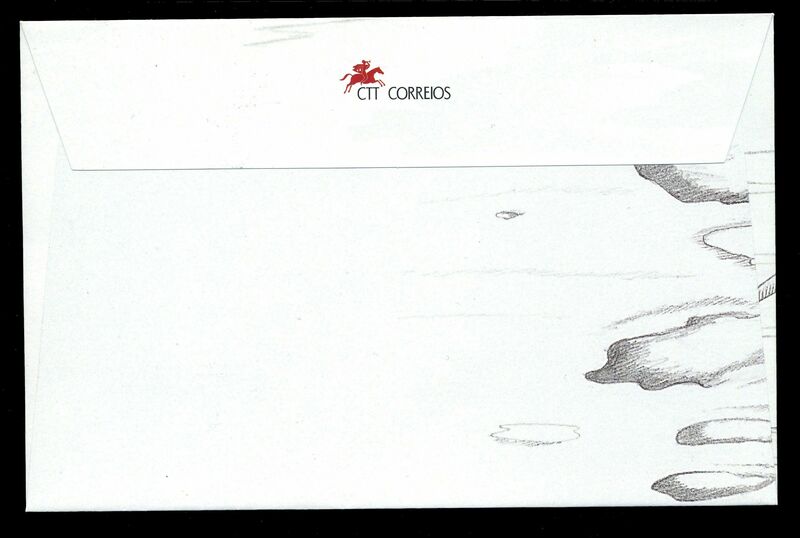 First Day Cover (FDC) has a post mark of City Lourinh. Lourinh is a municipality in Portugal with a total area of 147.2 km and a total population of 24,601 inhabitants. The seat of the municipality is the town of Lourinh, with a population of 8,800 inhabitants.The municipality is composed of 11 parishes, and is located in the District of Lisbon. The area of Lourinh is known by the Late Jurassic findings of dinosaurs and other fossils, and give the name for Lourinh Formation. 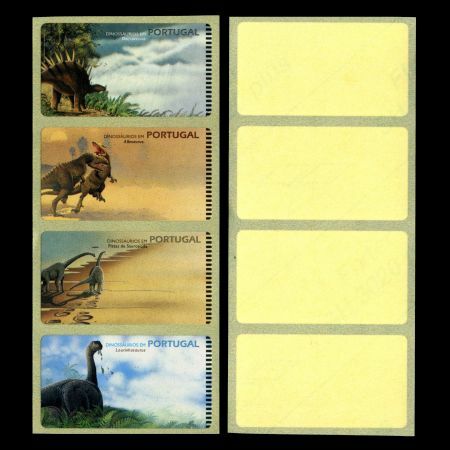 Fossilized remains of all three dinosaurs depicted on the stamps are found there. 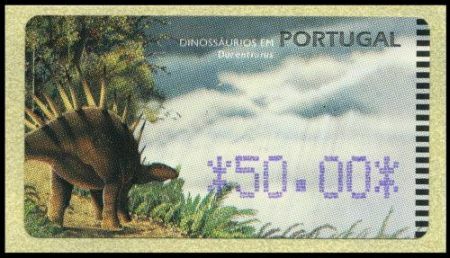 The Museu da Lourinh holds the main dinosaur collection. The museum was founded in 1984 by GEAL - Grupo de Etnologia e Arqueologia da Lourinh (Lourinh's Group of Ethnology and Archeology). The museum has very complete exhibits of archaeology and ethnology, but the main focus of the museum is the palaeontology hall, which presents casts of famous dinosaurs, as well as fossils recovered from the Late Jurassic Lourinh Formation. Among these is the famous theropod nest found at the beach of Paimogo, which contains eggs with embryos inside, probably belonging to Lourinhanosaurus. 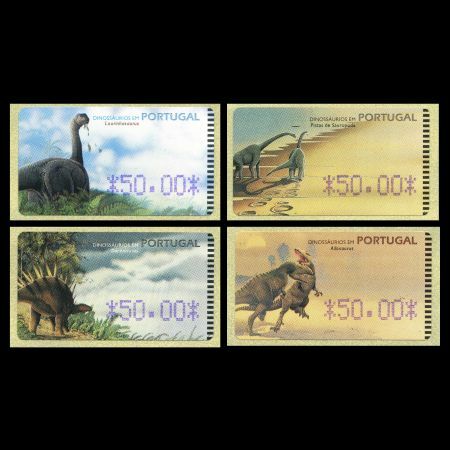 Some 150 million years ago, Western Portugal was a great coastal basin with plentiful supplies of water and vegetation that made it an ideal habitat for dinosaurs. At one site of particular interest, a group of female dinosaurs once gathered to lay their eggs in the calm waters of the lagoon. The youngest stood 6 metres tall, with the eldest some 8 metres. Each laid 20 eggs, measuring 12 cm each. Today, visitors can see the fossilized remains of the eggs of 180 carnivorous dinosaurs making it the largest such nest in the world - and uniquely the eggs contained embryos. 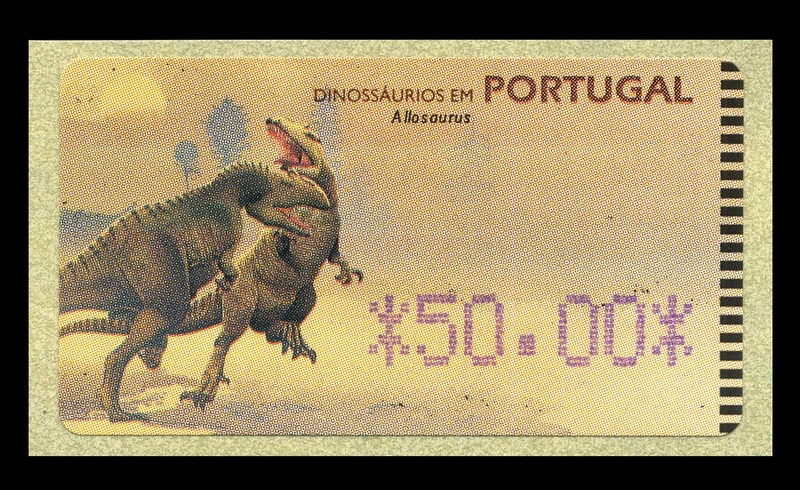 This is how Portugal stamped its mark on the map of palaeontology. 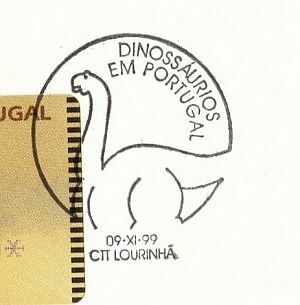 Lourinhasaurus (meaning "Lourinh lizard") was a sauropod dinosaur genus hailing from Late Jurassic strata from two localities in Estremadura, Portugal. It was described by Dantas et al. in 1998. 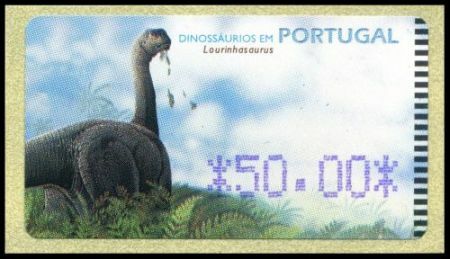 Its type species is Lourinhasaurus.alenquerensis, named for the locality of Alenquer. 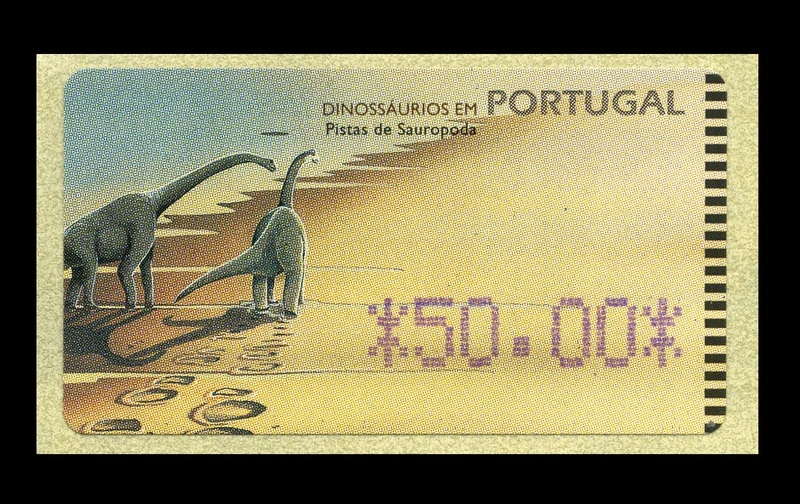 Portugal is home to some of the most well-preserved remains of dinosaur's footprints. 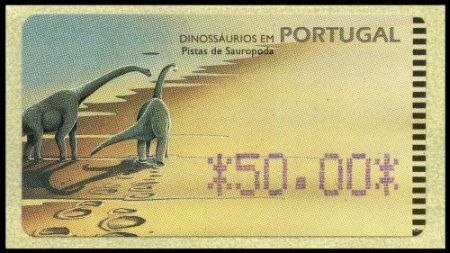 Situated at the heart of Natural Park of Serra de Aire and Candeeiros, the Natural Monument of the Dinosaur Footprints is an important fossil testimony of the Jurassic Period, where the traces of the biggest beings ever on Earth: the Sauropoda Dinosaurs have been preserved. 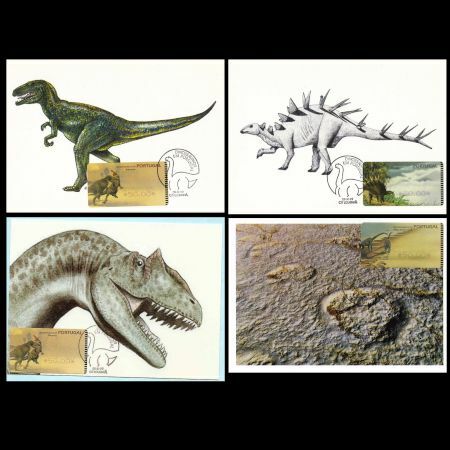 The Dinosaur footprints imprinted in limestone are 175 million years-old. Here you can observe 20 trails or tracks, one of them is 147m long and the other one is 142m long. 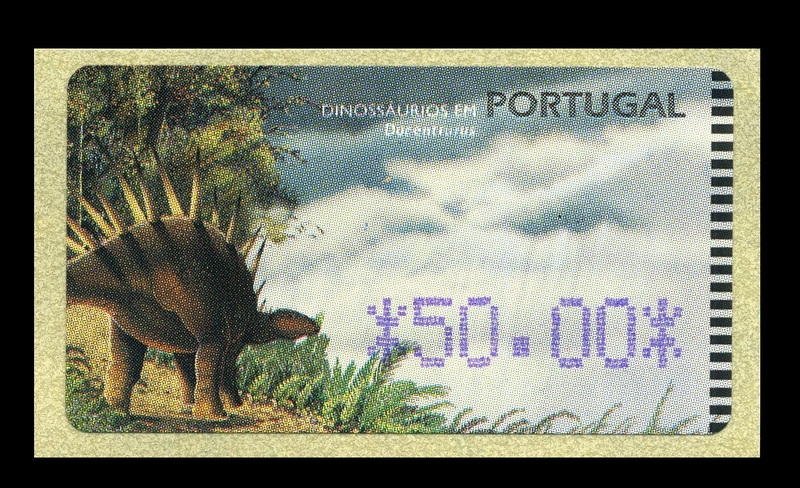 Dacentrurus (meaning "tail full of points"), originally known as Omosaurus, was a large stegosaur dinosaur of the Late Jurassic Period (154 - 150 mya) of Europe. Its type species, Omosaurus armatus, was named in 1875, based on a skeleton found in England. In 1902 the genus was renamed into Dacentrurus because the name Omosaurus had already been used for a crocodilian. It was a heavily built quadrupedal (walking on four legs) herbivore, adorned with plates and spikes. Due to the fact it represented the best known stegosaurian species from Europe, most stegosaur discoveries in this area were referred to Dacentrurus. This included finds in Wiltshire and Dorset in southern England, fossils from France and Spain and five more historically recent skeletons from Portugal. Most of these finds were fragmentary in nature. 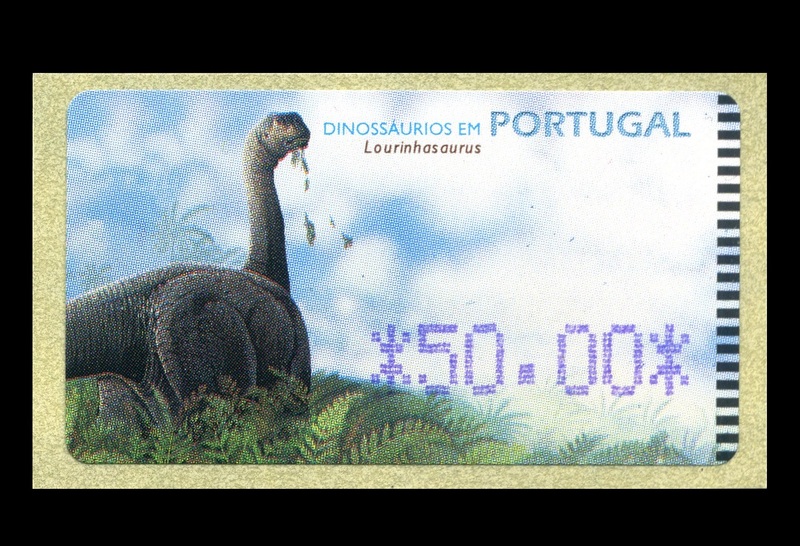 Also eggs attributed to Dacentrurus have been discovered in Portugal. Allosaurus is a genus of large theropod dinosaur that lived 155 to 150 million years ago during the late Jurassic period. The first remains that can definitely be ascribed to this genus were described in 1877 by paleontologist Othniel Charles Marsh. As one of the first well-known theropod dinosaurs. Allosaurus was a large bipedal predator. Its skull was large and equipped with dozens of large, sharp teeth. It averaged 8.5 m (28 ft) in length. The bulk of Allosaurus remains have come from North America's Morrison Formation, with material also known from Portugal and possibly Tanzania. 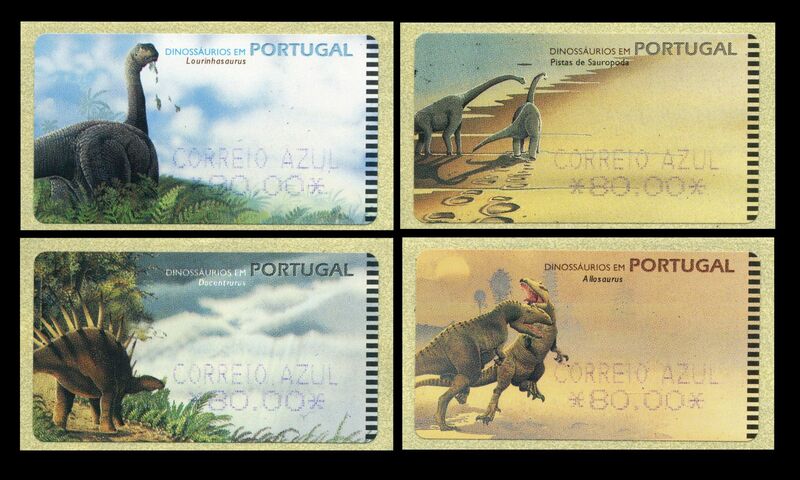 Related: Portugal 1999 "Examples of circulated covers" Portugal 1999 "Stamp variations" Portugal 2000 "Dinosaurs of Portugal" Portugal 2002 "Dinosaurs of Portugal" Portugal 2003 "Dinosaurs of Portugal"
Acknowledgment: Many thanks to fellow stamp collector Vitor Vieira from Portugal, for his help to find some information about these stamps and who share scans of some stamps and covers.